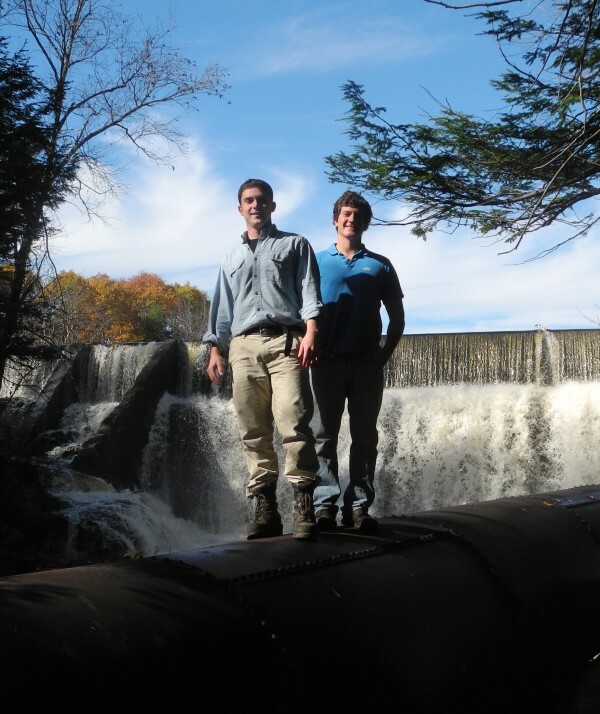 Nicholas Cabral (left) and Nicholas Berner stand on the penstock that runs from the 80-foot Gleeson Dam on the Goose River. The Maine Maritime Academy midshipmen last year purchased Goose River Hydro with the intention of restarting it and generating electricity. On Aug. 1, they began to make power at one of the three power plants on the 10-mile system. 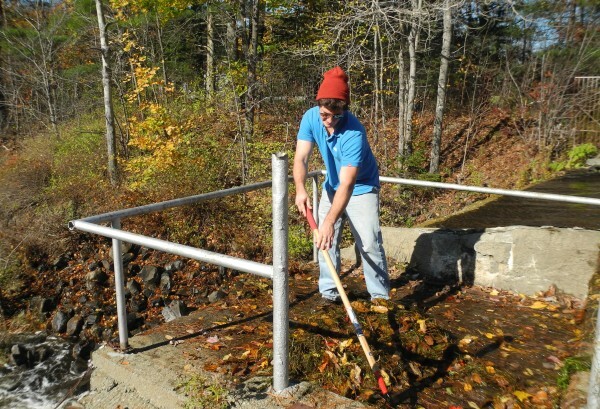 Maine Maritime Academy student Nicholas Berner grabbed a rake Saturday to clean fallen leaves from the water intake grate at the Mason Dam on the Goose River in Belfast. BELFAST, Maine — It was dim, damp and loud Saturday afternoon inside the small Mason Dam power plant, as water diverted from the Goose River turned the propellers of two turbines and generated electricity — 70 kilowatts per hour, to be exact. Although the mechanical vibrations inside made it impossible to talk, the proud smiles of Maine Maritime Academy students Nicholas Berner, 23, and Nicholas Cabral, 22, said it all. The midshipmen, now finishing up their studies in marine systems engineering, purchased Goose River Hydro last spring, optimistic about their chances of getting the three power plants and five dams up and running again, but uncertain of what it would take to get there. “It’s definitely not for the faint of heart,” Cabral said of the duo’s 15-month-long odyssey navigating red tape and figuring out hydropower engineering on the fly. They worked with local, state and federal agencies. They tinkered on machinery many nights in Belfast until 1 or 2 a.m., then jumped into a Subaru to travel the 45 country miles back to Maine Maritime Academy in Castine to make it to class on time. They struggled to balance schoolwork with the massive, real-life project that had so much potential but required so much sweat. “You’re going to get dirty,” Cabral said. “You’ve got to enjoy the work,” Berner added. Both remember Aug. 1, the day they first started making electricity at the Mason Dam power plant, with joy. That day had seemed tantalizingly out of reach for some time. Shawn St. Jean, a senior electrical engineer from Westbrook-based SGC Engineering, was a consulting engineer for Berner and Cabral’s project. He said that the duo did everything they could by themselves, saving many thousands of dollars by building electrical panel boxes to Central Maine Power’s specifications in St. Jean’s basement. Though Berner and Cabral have started to receive payments for the power they’re selling to CMP’s grid, the work is far from done. Their next intended goal to restart what they will call the Gleeson Dam, a massive dam with an 80-foot drop that is downstream on the Goose River. The name is in homage to Larry Gleeson, a mathematician and oil company executive who moved to Maine in the mid-1970s to purchase the mostly abandoned series of dams on the Goose River. Hydropower has historically been a powerhouse in Maine, with its many rivers that tumble from the mountains down to the sea. There were 33 dams at the end of the 19th century on the 10-mile-long Goose River, which runs from Swan Lake to Belfast Bay. People harnessed the water’s power to make axe handles, grind grain, mill lumber and make leather board for the state’s shoe industry. Gleeson, who died several years ago, and his wife, Cathy, moved their family into the old office for the Sherman & Co. leather board mill on Swan Lake Avenue. They showered under the waterfall from the mill dam while they worked to get the hydropower dams running, ultimately generating as much as 1.5 million kilowatt hours of electricity per year. They had a contract with Central Maine Power to purchase the electricity generated on the Goose River. Berner and Cabral, who purchased the hydropower plant from Cathy Gleeson, said that they have learned a lot from Larry Gleeson’s work as they have rehabilitated his hydropower system. They also enjoyed using the waterfall and the reservoir above it this summer while they and many friends worked to make the old office habitable again. “We call it our infinity pool,” Berner said of the reservoir. Giving the Gleeson Dam and powerhouse a makeover is a big next step. Cabral and Berner figure it was last used in the 1990s, and that it will cost them half a million dollars to get it up and running again. “Sweat’s free,” they added cheerfully. Once done, it should quadruple their electrical generating capacity. And while it is a daunting amount of money, there is some interest from investors and from other people who would like to help. “The whole system is a working laboratory for innovators from Maine and all over the country,” Cabral said. They figured that what they’re learning on the Goose River could be replicated in other places in Maine, a state with several hundred dams that are not being utilized for power production. One thing that has surprised them is learning that it takes so long to get hydropower plants licensed — longer, they said, than to license a nuclear power plant.